During the summer, Vibrant Virginia held the first Community Conversation in St. Paul, VA, aka Southwest. The conversation convened Virginia Tech faculty and staff with community partners to discuss regional opportunities and challenges with a goal of opening channels of communication between regional partners, faculty, and staff. The topics of conversation centered on Agriculture and the Environment, Community Development, Entrepreneurship and Innovation, and Education and Workforce Development. These conversations provided a platform for community stakeholders to offer an overview of regional community, workforce, and economic development activities and resources. In turn, Virginia Tech engagement staff and faculty shared their research, interests, and work. The first conversation in Southwest took place due to the region’s proximity to campus and the sizable amount of regional engagement projects ongoing (we counted more than 60 from a survey we collected). Our next conversation will take place in Newport News from February 11-13, 2019. Like every corner of the Commonwealth, Virginia Tech has a presence in Eastern Virginia (the cities of Chesapeake, Hampton, Newport News, Norfolk, Petersburg, Portsmouth, Richmond, Suffolk, Virginia Beach, Poquoson, Colonial Heights, Hopewell, and Williamsburg, along with the Counties of Accomack, Amelia, Caroline, Charles City, Chesterfield, Dinwiddie, Essex, Gloucester, Goochland, Hannover, Henrico, Isle of Wight, James City, King and Queen, King William, Lancaster, Mathews, Middlesex, New Kent, Northampton, Northumberland, Powhatan, Prince George, Richmond, Southampton, Surry, Sussex, Westmoreland, and York) with four Agricultural Research and Extension Centers, 42 local extension offices, the two Hampton Roads Centers, and soon with the opening of Tech Center Research Park. 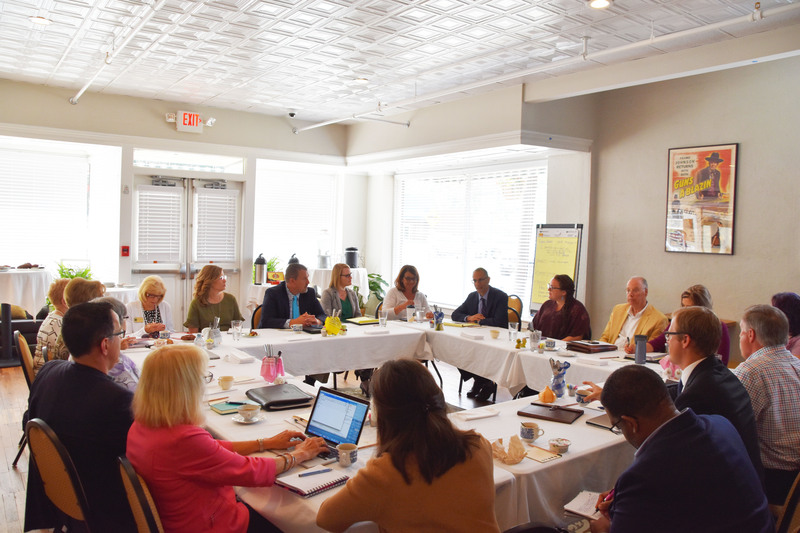 The goal of these Vibrant Virginia Community Conversations is to allow participants brainstorm ways to bolster current partnerships and projects between the community and the university and to discuss new ideas to approach communities’ challenges. The university has a breadth of faculty, staff, and students already working on innovations for these industries. However, this conversation provides an opportunity for engaged faculty to listen to the needs and opportunities specific to Eastern Virginia. Inherent to the Land-Grant mission, the institution must remain adaptive, responsive, and proactive to the changing economic, community, and workforce development environment and Vibrant Virginia Community Conversations are a key way to accomplish this mission. For a more complete coverage of the Southwest Community Conversation, read this new release. For more information on how to participate in this, or the next community conversation (which will be in Southside, then Northern Virginia) please contact Sarah Lyon-Hill at sarahlh@vt.edu or Albert Alwang at aalbert1@vt.edu.